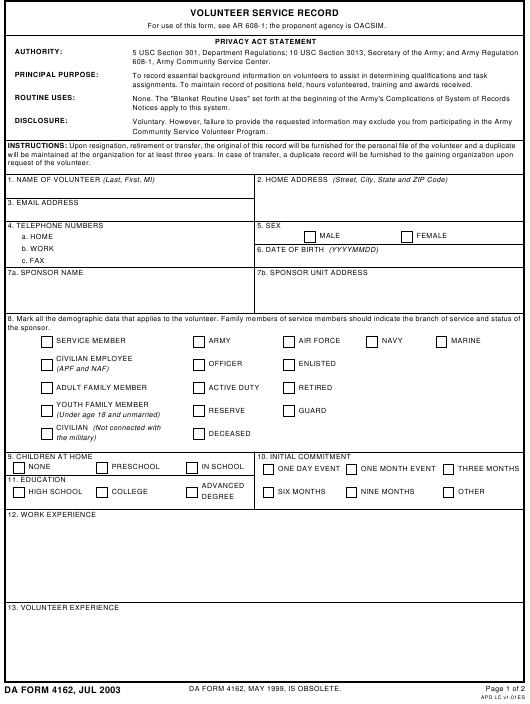 DA Form 4162 - also known as the "Volunteer Service Record" - is a United States Military form issued by the Department of the Army. The form - often mistakenly referred to as the DD form 4162 - was last revised on July 1, 2003. Download an up-to-date fillable PDF version of the DA 4162 down below or look it up on the Army Publishing Directorate website. For use of this form, see AR 608-1; the proponent agency is OACSIM. 608-1, Army Community Service Center. assignments. To maintain record of positions held, hours volunteered, training and awards received. DA FORM 4162, MAY 1999, IS OBSOLETE.